Combine the blue cheese and cream cheese. Add milk until you reach a spreadable consistency. Fold in the chopped walnuts. Serve with crackers or pretzels. Alternative: Do not add as much milk, roll into a cheese ball or log, and press whole walnuts into the cheese. 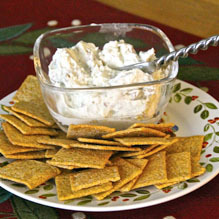 Serve as a cheese ball/log with crackers or pretzels.